I have some great news, my lovely sponsor Mini Boutique ( you can read all about them here) is graciously giving away a lovely piece from the Stella McCartney Fall 2013 Collection. How awesome is that? Stella McCartney is sort of the reason I started blogging- that was the subject of my second and third post! If you live in Canada, well then you might know how hard it is to get the collection shipped to you. Now you can shop online on Mini Boutique. Stella McCartney is one of the many cool brands this awesome shop carries. I am kinda loving this collection... a lot. The coats are fabulous and that dip dress is amazing, you might want to check out all the sweaters too, oh and the shoes! So would you like to know more about the giveaway? Here is your chance to win this adorable Thumper Knit Sweater, it is 95% Cotton 5% Cashmere and super soft. It come in 3 sizes: 6, 12 and 24 months- you get to choose one. All you need to do is follow the steps in the rafflecopter bellow... don't forget to leave a valid email address and let us know what your favorite Stella McCartney item is by visiting the Mini Boutique webshop and leaving a comment. This giveaway is open to Candian and US adresses only. Sorry! You have until October 22nd to enter. Good Luck! I am very excited about todays post, for many reasons! First, I would like to introduce you to the world that is of Monika Elena! Monika is one of these photographers you wish lived closed by so she could capture your kids and your daily life in a dreamy and poetic way. She is a talented photographer who uses light in such a powerful and captivating way. She is the photographer you want to hire for your editorial photo-shoots. She captures the little details with great attention. She makes the mundane extraordinary. I've been a fan for a long time now. I've written about my love for her here and she has inspired me to put this together. You've probably seen her work in Papier Mache, La Petite, Babiekins, Milk, Naif and many more amazing magazines. Or perhaps you've seen her fashion editorials campaigns for Noro Paris, Fournier, Fafa, Nixie Clothing... just to name a few. Did you know Monika Elena also takes beautiful family photos- I didn't until recently! I really do love her polaroid series too. What can I say, I am a huge fan! So when Monika contacted me to see if I would be interested in collaborating with her, how could I refuse! Here is the thing, after living abroad for a few years Monika is finally back home in California, San Francisco to be more precise and today she is offering YOU my readers the opportunity to win a family photo session. Say what? I know crazy right! So if you live between Sacramento and San Francisco or perhaps you are willing to travel to this area- then this G-I-V-E-A-W-A-Y is for you!!! I have to say I am super jealous, that's an understatement. So what do you need to do? You must leave a comment, telling what you love most about Monika Elena's Photography. You should visit her website to see all that she does! Then you can complete the rafflecopter to get some extra entries. It's that simple. The giveaway ends Wednesday September 11th and you will be contacted via e-mail. Please I would love it if you shared the giveaway, tell all your California friends! This is really too good to pass up. Also if you aren't the lucky winner of the giveaway and would like a photo session with Monika don't hesitate to contact her via her website. And if you are like me, very far away then I hope you enjoy Monika' s photos as much as I do and hopefully they will inspire you a little. I was busy last week, having fun with a new pattern I received from the talented Rachael of Imagine Gnats. She recently came out with her first PDF Pattern the Roly-Poly, it's a pinafore, a tunic, why not even a dress. It's a simple pattern- great for a first sewing project, and yet the possibilities are endless. There are a few things you can choose to do, such as add pockets, sew it in 1 or 3 pieces, make it reversible- for me he beauty of this pattern, is how it showcases the fabric beautifully and really becomes a canvas for you to play with. I entitled my Roly-Poly, the 4 Seasons. On one side, you have the summer blue sky and the sea with a little sun shining through. I cut my fabric out of 1 pattern piece, extended the back straps so I could used them as closure instead of buttons and put the buttonholes on the front of the tunic. I had so much fun Dip Dyeing my fabric. I cut out my piece first, which is the same fabric as the reverse, then I proceeded to the dyeing process. I dipped most of my fabric into my solution. Unfortunately, the front panel fell inside my pot, I was a little upset as I wanted some of the beige fabric to show on the center front- I ended up bleaching that a little at the end! I gradually lifted my fabric from my solution and then added some darker dye for the bottom half- going through the same process. I think it turned out pretty well. I added some hand embroidered details to it finish of. I bought this fabric at my local fabric store over a year ago, I fell in love with the print and the colors, I also loved how soft and light weight it was. Initially I was going to make a skirt with it for me- I can't remember the last time I made myself something! This turned out much, much better! The print ran along the side of the fabric, so I cut my pattern against the grain and used the other half of the for the reverse side of the Roly-Poly- it all fit perfectly in the meter I had. I wasn't crazy about my color choices at first, I felt like both sides of the tunic didn't quite work well together. What was I thinking making both sides completely different! Once I sewed the pieces together it ended up looking just fine. This pattern was such a pleasure to put together and sew, I can see myself making many more in the near future. I used Miss E's measurements to figure out the sizing, I ended up making the size 3 and lengthening it to size 4, I could have made a size 4 since the fit is loose and the extra fabric crossed over in the back anyway. Next time! Don't forget to check out all the other wonderful Roly Poly Pinafores popping up on the web and lot's more to come this week... It will give you such a sense of how much can be done with this pattern and you can witness how much talent is out there too! Today I'm part of the Fancy Pants Leggings Blog Tour. Laura from Crafstorming recently releases her first digital pattern, the Fancy Pants Leggings as part of her new pattern company Titchy Threads. I've been lucky enough to be part of the process since the beginning- so far I've made the short version, the legging version, I created my own swimsuit versions and well today I added on a little to the pattern and made a jumpsuit. You can see all the previous versions I made here if you like. I and Miss E loves this pattern, it really is comfortable and easy to wear and such a quick sew. This time around I wanted something Miss E could just wear quickly over a bathing suit or a tee that was cute and comfy all at once. Nothing beats a knit jumpsuits for that! 1. I added 5 cm to the width of leg- on either side of the pattern. Going from nothing at the mid thigh and straight down. I wanted to give the hem a little bit more of a balloon effect. 2. I doubled the width of the hemmed cuff. It's a little long now, but I want Miss E to grow into it. 3. I created the straps. I cut 4 pieces about 4.5 cm by 60 cm. I fused 2 of the pieces (1 for each strap) to give a little more structure. I made the straps a little longer- so Miss E can grow a little. 4. The front panel consists of the peices 22 cm by 24 cm. I fused the inner piece for more hold. It's a little stiff right now, but I know it will soften once I wash the jumpsuit. I sewed right side to right side around 3 edges, turned the fabric over and ironned. Then I folded over towards the front at 6 cm and folded the corners up- ironned it down and handstitched the fold in place. 5. I pinned the front panel and back straps (on a slight angle) to the legging and the pinned the waistband as well and sewed it in as directed. 6. Added some large snaps to the inside front panel and straps. *** I'll be stitching the back straps together so they don't fall off her shoulders so much. It's good to try things on sometimes! The fabric is a very light weight cotton jersey- I think it will be perfect for the hot summers days and a quick stop at the wading pool. I can't believe this is Laura's 1st pattern- it is really perfectly executed. If you've never sewed knits before, this is the pattern you'll want to start with, it is a quick and easy sew with plenty of explanations and clear photos helping you along the way. 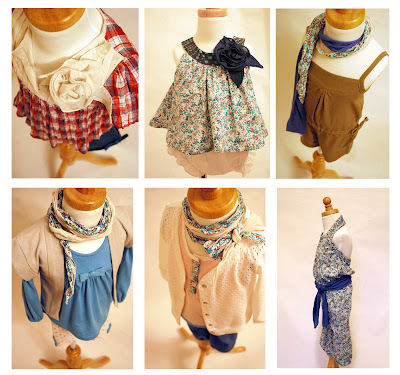 There are also lots of great tips on how to sew knits too. You can't see it from my jumpsuit, but the pattern has a cute insert in the bum area making it lots of fun and a really creative way to add some cute elements on the behind. I think it's what makes this pattern extremely comfortable. It comes in sizes newborn to 4T. Can't wait for the bigger sizes so I can make Mister M a pair or 2 or 3!!! It's available for purchase on the Titchy Thread website, however Laura is giving away a copy to one of my lucky readers!!! Yeahhhh! All you have to do is complete the Rafflecopter and don't forget to leave a comment. The giveaway closes on Monday and I'll announce the winners Tuesday- GOOD LUCK!!! 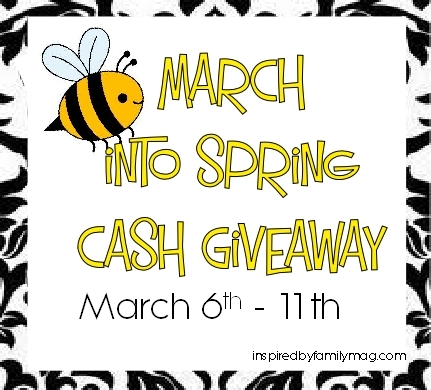 We are excited to kick off our March Into Spring Cash Giveaway. Some lovely bloggers who love their readers and myself have joined up to bring this $110 Cash Giveaway to you. Joining in the fun are Marty's Musings, De Su Mama, Mothering From Scratch, Inspired by Family, True Aim Education, She Shares, Royal Baloo, The Mom Cafe, Petit a Petit & Family, The Meaningful Mama, Mercy Ink Blog and Stephanie Page. We appreciate every second you spend here and every sweet note you have left us. This is our little way to thank you! Also, make sure you stop by Inspired by Family for the All Things Spring: Crafts, Recipes, Inspirational Encouragement, Kids crafts, home decor and more featuring some of the lovely bloggers mentioned above! All mandatory entries will be verified so make sure you do all the mandatory entries first using Rafflecopter. It’s open to everyone (not minors) and one winner will be chosen via Rafflecopter to receive $110 in PayPal cash or Amazon gift card. The winner’s name will be displayed on this post after the giveaway ends and you will be contaced by email (leave your real contact info). You have 24hrs from the time your contacted to respond otherwise another winner will be chosen. You are not signing over your first born inheritance by entering this contest on Rafflecopter. None of the bloggers above will share your information entered with a third party. If you are in a hurry, you can do a few now and stop and come back to do more. To follow a blog via Facebook means that you will see the bloggers post in your Facebook feed. You must do the entries on Rafflecopter. So if it says follow my blog via email go to the blog and follow and let Rafflecopter know by answering the question. If you are already a follower just respond with the name you used to follow under. So we can verify your entry. So are you excited? 110$ to spend on whatever you like- A-M-A-Z-I-N-G!!! Fingers crossed. Secondly, can you believe I've been blogging for 2 years!!! Happy Anniversary Petit a Petit! Thirdly, I reached over 500 likes on Facebook. I'm giving back the love today with Sunday In Color - on of my favorite kids online shops, read all about it here. This giveaway is 2 Cute 2 Be True!!! You can win one of five "2 Cute 2 Be True" handmade crochet soft toy. These stuffed toys make great friends or decorative elements- they are soft, hugable and loveable. They stand 10' tall- wow! - Check out the Sunday in Color Website and tell me in the comments which "2 Cute 2 Be True" you would like to win. My favorite one is on the website waiting for you to discover! *** let us know your login names in the comments. - Spread the word for an other entry on the social media of your choice- don't forget to tell us how you did it! This giveaway is open worldwide- did you know Sunday In Color ships worldwide? You have until Sunday 24th- midnight to Enter. The winner will be chosen at random and notified by email ( make sure we have it!) and anounced on Monday. If you are from Montreal, coming to Montreal or just passing through you should definitely come check out PRPL Kids... It really is Montreals best kept secret! It's almost impossible to find, but once you do, you just keep coming back for more! PRPL is a kids boutique specializing in the tween market, but no worries you'll find something for the whole family... from newborns to teenagers and maybe even something for Mom. It's also a great place to shop for special occasions with brands like Blush & Hollyworld. The service is impeccable, Lori & Deborah are so fun and sweet, and they always know just what you'll need! If you pass by, don't forget to come say hello... To ME! I work in the same "office", you'll just have to come a see what I mean! Leave a comment, telling us which T- Shirt you like best and what size you would like it in. For 1 extra entries, LIKE me on Facebook or FOLLOW me on Twitter. Anyone can participate, we'll ship internationally... spread the word and good luck! You have until Sunday Dec 11th Midnight, that way we mighth get it to you in time for the holidays. I'll announce the winner Monday Morning. I thought I would start the week with a giveaway, but not just any giveaway... It's the Craft It Forward giveaway. I promise to send something handmade to the first 5 people who leave a comment here... They must in turn post this on their blog or on the Craft It Forward Facebook page and send something they make to the first 5 people who comment. The rules are that it must be handmade by you (sewing, painting, pottery, photography, doodle, whatever! ), and it must be sent to your 5 people sometime in 2011. I commented on I'm with Leia's blog and I can't wait to see what I'll get in the mail... I promise to share as soon as I get it! When you leave a comment, let me know if you want something for you or your kids.... Don't forget to leave your e-mail as well. You have no idea how excited I am... Tis the season to be jolly! For our first giveaway, you will be able to choose 2 of your favorite spring-summer 2011 Laila b. accessories. So what do you have to do? Simple, just leave a comment: let me know which two accessories you would like and how you would style them (don't forget to leave your e-mail)! And in a couple of weeks I'll let you know who the winner is. By the way, this giveaway is open to anyone, no matter where you live... I'll ship Internationally. Good Luck! Here are a few ideas as to how you can wear these accessories.